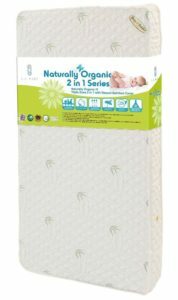 Choosing an infant mattress is a very difficult decision for most parents and grandparents. Safety is the primary concern, because everyone wants to know that when they tuck their little one in, morning will come with a happy and well rested baby. Serta Mattresses are popular for grown-ups, so it should not come as a surprise that parents also choose Serta crib mattresses. However, that is not the only reason these mattresses are number one. 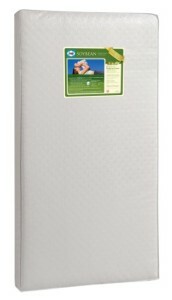 To find out more about the features of Serta, you should read our Serta crib mattress review. For more than 80 years, Serta mattresses have been a constantly improving brand of mattresses. It all began with the Serta Perfect Sleeper mattress line of mattresses and has grown into one of the most popular name brands available in the mattress industry. This has also led to them creating several crib mattresses to give parents a name they can trust for their infants and toddlers as well. How Does Serta Crib Mattresses Measure Up? If you are a price shopper, you should know that Serta is more affordable than some of the other popular crib mattresses available, especially the Dream on Me brand. Simmons and Sealy are comparable in price, but not in quality. However, it depends on the mattress that you are looking at. Serta is also one of the easiest to choose from because of the variety of the mattresses. Some have springs, some have foam, and some are organic. You get to pick the one you feel most comfortable with. With some of the other mattress brands, you do not get that type of selection. This is perhaps one of the biggest reasons parents love Serta baby beds and the Serta Perfect Dream crib mattress arc considered the best. What Type of Serta Crib Style Is Best? 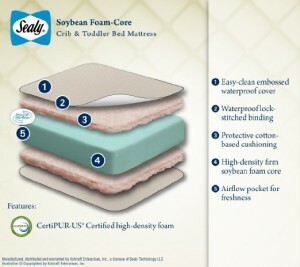 We have included some of the most popular Serta crib mattresses based on their popularity among parents. 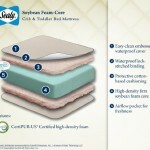 If you love Serta, you should check out the Serta crib mattress reviews below. Perhaps through them, you will find the right mattress for your little one. Every day parents spend countless hours looking at different style cribs and mattresses. The common goal is to find the one that they feel is going to be best for their baby to sleep on. That is perhaps why there are so many choices in crib mattresses. Some parents choose based on name brand and others choose based on features. One brand that many have not heard of is LA baby. However, by not knowing it is there, you could be missing out on a lot of comfort for your baby. 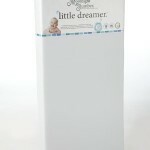 To find out what makes it great, you should read our LA Baby mattress reviews. 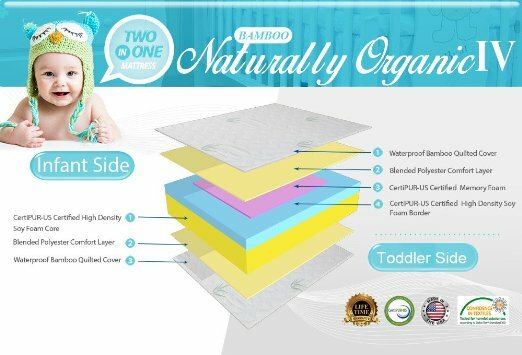 One of the biggest things you will like about the LA Baby mattress is the fact that it is a truly organic mattress for your little one. 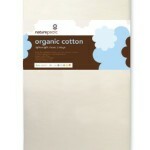 One of the most popular choices is made of bamboo viscose and eco-soy foam. There are different styles and accessories that you can choose from as well. 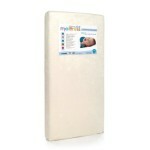 These mattresses are also made in the USA and more affordable than many other brands. What’s not to love about that? 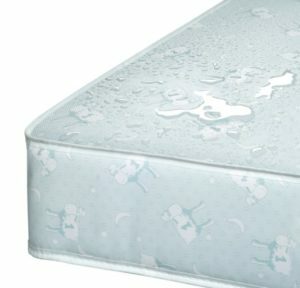 How Does the LA Baby Mattress Compare? 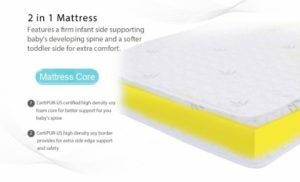 When you compare LA Baby mattress reviews to other popular brands, you will quickly see that parents are happy with the LA Baby brand of mattress. Parents enjoy that the LA Baby has a firm side for infants and then a more comfortable toddler side. Some parents say that they wish they could find a mattress like it for themselves! They do like the Serta price better, but overall, it just does not have the same amount of positive reviews. If you are looking at the portable crib style of a Dream on Me mattress, you will find that LA Baby is much cheaper and holds the same overall rating. To some, this makes it a better deal since you really do not lose anything. To get a better idea of what LA Baby has to offer, you should look through our short reviews. These are mattresses that other parents tried and loved using with their baby. Perhaps this will make your decision a little easier. 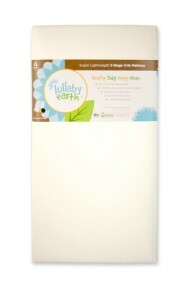 Lullaby Earth baby products are showing up in stores everywhere. 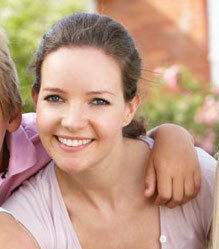 They provide the quality and safety that parents love for their little ones. With that being said, is there any wonder that this company also provides one of the best-selling crib mattresses available? Their mattresses have a lot of features that most parents look for when choosing an infant’s first mattress. Perhaps it will also make you feel good about where your baby sleeps at night. 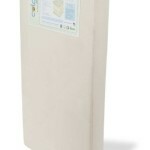 The Lullaby Earth crib mattress is lightweight weighing in at only 7 pounds. 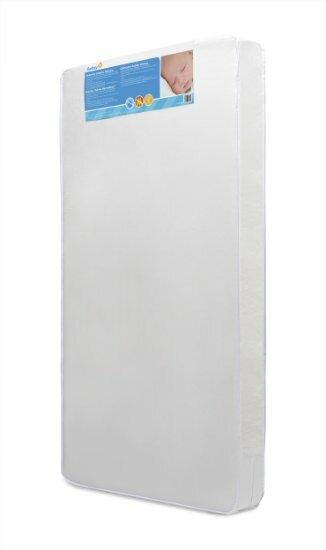 This makes it one of the lightest mattresses available, but it does not mean that it is not able to provide the support that your child needs from birth through toddlerhood. You simply have to flip the mattress to switch from an infant crib mattress to a softer toddler bed mattress. 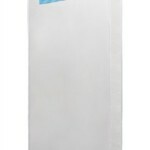 It has a waterproof outer cover that provides seamless edges. 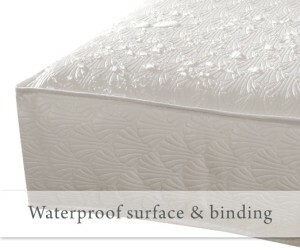 The fact that it is waterproof is a great thing according to most parents because they will be able to wash the mattress with mild soap and water when an unfortunate accident occurs. 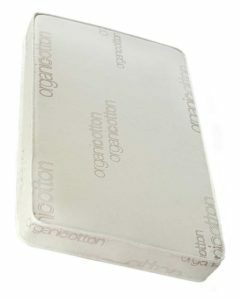 The waterproof cover also ensures that it will not emit harmful odors. 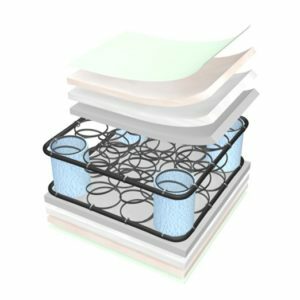 There are no chemicals or allergens within the mattress and you can ensure that it stays that way. 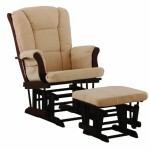 This also means that you will not need to add an additional top pad. Some parents do choose to add a pad though, because it can increase the softness of the waterproof covering. It fits easily into all cribs and toddler beds. This means that your child will be able to sleep comfortably as they grow and you will only have to purchase one mattress for their early years. 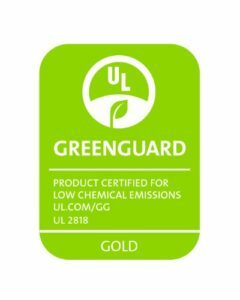 This mattress is also made in the USA and meets all the US standards for safety regarding infant and toddler mattresses, including the fact that it meets the strictest GreenGuard Certification standards. It also has a limited lifetime warranty on it to ensure that you are totally happy with your investment. 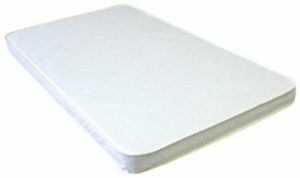 Inside the mattress, the stuffing is made of food grade PE and polyester batting. This increases its ability to be allergen resistant. 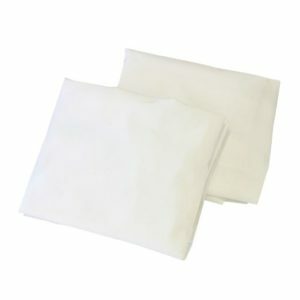 It is also one of the main reasons that it remains very lightweight, but firm enough to prevent infants from rolling over in their sleep accidently. 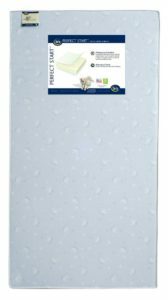 Many parents have used this crib mattress for years with their growing child and they remain just as happy with the mattress as they were when they first received it. Owners report no issues of the mattress sagging. They have never noticed any issues with the stitching. Some have purchased more than one for their family as it grows and they have never noticed one mattress being of less quality than the other. Some people feel that their mattress was defective. They feel that there was an air pocket inside of it that made it unsafe for their little one. 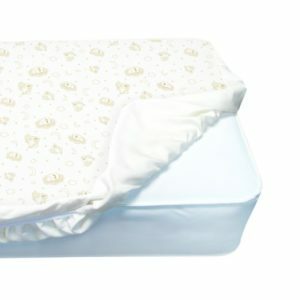 Some parents feel that their newborn is not able to sleep comfortably on it because it is too firm. However, most issues that people have found regarding this mattress is solvable by taking advantage of a very easy, no hassle return policy. 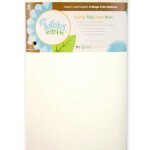 Is This Lullaby Earth Mattress What You Are Looking For?